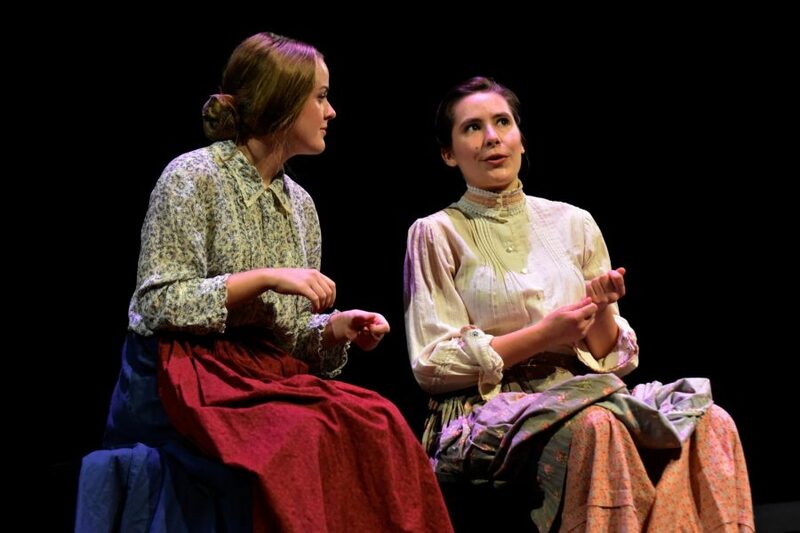 Ellie Lang-Ree (12), in the role of Mrs. Gibbs, mimes stringing beans with Marina Logue (12), who plays Mrs. Webb. "Our Town", this year's fall play, portrays a pre-industrial small town at the cusp of the 20th century, with machinery and cars appearing as the play's timeline progresses. The faint smell and sizzle of bacon circulates throughout the audience while Mrs. Webb, played by Marina Logue (12), prepares breakfast on stage. Her daughter, Emily, played by Dilara Ezer (12), travels back in time to experience her 12th birthday again after dying, painfully reminiscing over her past memories. A cast of 19 actors and three onstage musicians performed Thornton Wilder’s “Our Town” in the Rothschild Performing Arts Center’s Patil Theater (RPAC) as the annual fall play — the first in the new facility — from Thursday to Saturday at 7 p.m.
For the inaugural fall play in the RPAC, director Jeffrey Draper chose a more deep and complex play that better resonates with audiences, instead of the more comedy driven plays performed in the recent past. “Our Town” depicts the everyday lives of the citizens in the fictional town of Grover’s Corners, New Hampshire, in the early 20th century. The story details the lives of Emily Webb and George Gibbs: the two initially grow close as friends, eventually falling in love and getting married. A decade after the wedding, after Emily dies and joins the rest of the deceased in Grover’s Corners, she decides to return to her 12th birthday, only to realize the value of the little moments in life. 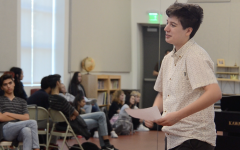 “It realistically portrays the truth about life, and it helps audiences realize the value of life as they’re living it,” Maya Franz (10), who plays Rebecca Gibbs, said. The play also features a musical trio on stage, with Zachary Wong (12) on violin, Anika Fuloria (10) on bass and Hannah Lak (12) on harp. The play frequently breaks the fourth wall, where the stage manager, who is played by several actors, directly address the crowd and interact with planted actors in the audience. This is a central component of the plot of the performance, as the play is set in the actual theater it is being performed in and relies on verbal exposition very heavily. Notably, for most of the play, the set is barren and the actors use very few props, instead depending on miming to portray the items their characters are holding. The only scene to have a set of any form is the final aforementioned scene, which depicts the house of the Webb’s family on the day of Emily’s birthday. This climactic scene ends with Emily’s husband, George, weeping at her grave, while she is only able to watch. The next plays performed will be the Student Directed Showcase in January. The characters of “Our Town” vary from the two central characters of Emily Webb and George Gibbs to their families, local residents — alcoholic choir director Simon Stimson, town Constable Bill Warren, milkman Howie Newsome and his mimed cow Bessie — and characters planted among the audience, whom characters onstage speak to. 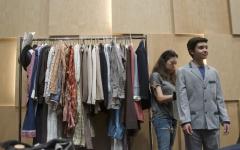 Here’s a look behind the curtain at the cast’s preparation for the play. 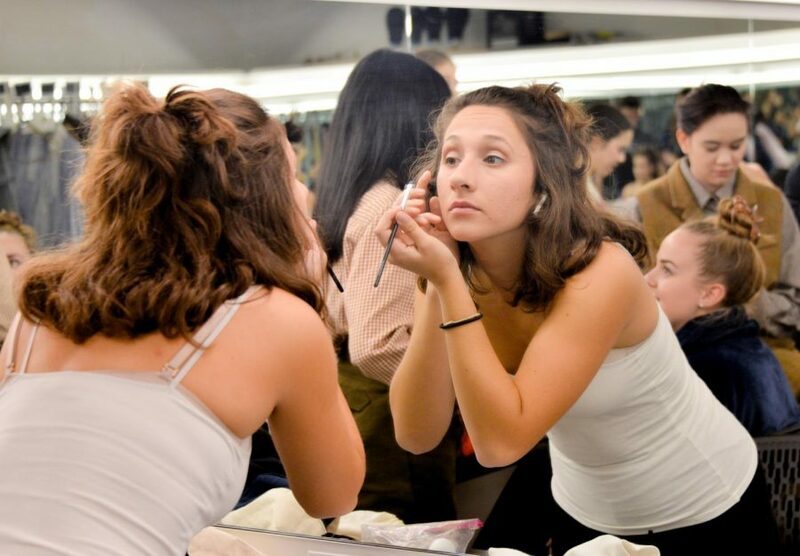 Dilara Ezer (12), who plays the central character Emily Webb, applies makeup before the fall play. In "Our Town", Emily is portrayed as a schoolgirl growing up, on her wedding day, and after her death during childbirth.